think I stopped writing book reports in high school. I always found it difficult to enjoy reading a book with the knowledge that I was going to be assessed on my ability to regurgitate information or explain my interpretation of the book… Which typically wasn’t how it was meant to be interpreted anyway. 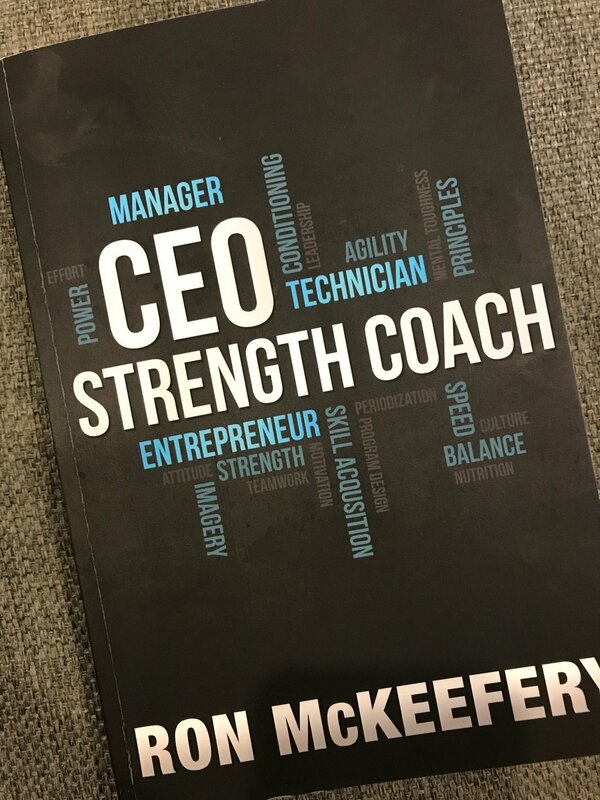 I bought the CEO Strength Coach by Ron McKeefery about a month ago in hopes it may be able to provide a better insight as to how you can better structure the role of a strength and conditioning coach as a progressive career. While it wasn’t exactly what I had expected with the majority of the content more applicable to the professional sporting scene in the US, I definitely picked up some valuable insights that I feel would assist anyone looking to get the most out of their professional career. 1. What is more important to you – money, pride or advancement? These are three things that the Author believes motivates people to choose to pursue a particular career. From your career are you predominantly seeking money, pride, or advancement? Are you motivated by a big pay check? By a title or responsibility? Or by the opportunity for personal and professional growth? There is no right or wrong answer to this question. It is equally OK to be motivated by money and the opportunities that it may bring for you and your family as it is by the opportunity for personal and professional growth. Becoming clear on your personal motivation will support you in ensuring that you are making a decision that is alined with your life journey. This is phrase the author tells any potential new coach at their first interview. Man, I wish someone had told me that at the start of my working career. I don’t believe that we are entitled to anything. As humans, we deserve very little. Despite this, I believed to some degree that the harder I worked, the more likely I was to see some sort of ‘reward’ whether that be financial or in terms of progression. Truth of the matter is that a lot of businesses that are limited to what they can provide fiscally by either revenue or budgets set from above. If you’ve identified that your primary motivation to work is money, then you’d probably be best picking a role that provides you with a secure salary and clear expectations of your role. If you’re motivated my personal growth – know that if you’ve chosen the right role your ‘compensation’ for your time and effort will be just that – growth. While logically that made sense in my head, we are told as a society that we work for money so for a long time I worked harder with that end goal in mind. But as we’ve just seen, that is not the only reason why we work. What I came to learn that if you are truly working a job you love, money won’t be the motivator. It is just a by product of a passion that you are realising. The only time money has become a driver for me is when I’ve been unable to pay my mortgage or when I didn’t have enough money in my account to buy a plane ticket. In those circumstances, I’ve typically done roles that have temporarily satisfied my bank account, not my soul. This is OK as a temporary fix however is not a long term solution. Which leads me to my next point. When considering your future career, there are four things you need to consider that you probably aren’t currently thinking about: marriage/relationships, family, time and security. Marriage/relationships: it is important to be with the right person. Working a non-conventional role can be a huge culture shock to those who aren’t use to 4:30am wake ups or 10:30pm finishes. Take your time to ensure that the person you are entering a relationship with is onboard with your seemingly crazy work hours otherwise you’ll be in from an uphill battle from the get-go. Family: with families, no matter what size, there are always things going on. Birthdays, events, being able to have weekday dinners…Having a job that isn’t strictly a Mon-Fri 9-5 will challenge your ability to be there with your family for important events. No matter what role you’re in, there will be times where you will be asked to choose between family and work. Know that you have the ability to make the decision. Time: Time away from the people you care about is a challenge. It is one that my family fought with the most. You want to be there all the time, but in many respects, when you own a business or you have clients that you work with 1:1 means that you’re working with potentially 100+ kids every day. Your role may also require you to be on the road for long periods of time meaning that time at home will be precious. Just as you schedule meetings and training, you need to schedule time for the things that are most important to you – even if this is the last thing you want to do when you’re working a 60hr work week. Security: the idea of starting your career in one place and finishing it in the same place is very rare, if not impossible. The author says that you aren’t really a coach until you’ve been fired once. It is easy to find a job and bounce around cities when you’re 25yo looking for the ideal role but as you enter later stages of your career and you become more established, it becomes a lot harder to uproot or change tact. But it is possible. It is not uncommon for small business owners or those who are self-employed to live paycheck to paycheck. While those around you are buying houses and new cars, you may still be renting in a share house. The market can also determine whether you have a job or not which can make it more challenging to feel secure in your chosen field. No one is exempt from having to make these choices however have confidence in knowing that you have the ability to choose your level of ‘sacrifice’ in each area. Everyones’ different priorities and motivators will lead them to make different decisions. It is important to respect that, even if you may not understand it. So those are just 3 key points I took away from this book. There are plenty more little hidden gems in here and I could highly recommend this book to anyone who is looking to make a sustainable career as a strength and conditioning coach.